I’m still holding onto my original prediction even though the public may never know the true story regarding the pilots on NWA Flight 188. The FAA has announced a revoke of the licenses of the two pilots involved who are now saying that they were too busy with their “laptops” to answer any calls from officials who wondered what in the hell they were doing. I have to wonder if the pilots have created a clever play on words by making the claims that they “lost track of time” while “working on their personal laptops” a.k.a., some mid-flight reach-overs. I have nothing against homosexuality. I wouldn’t be surprised if NWA was aware that this is how everything went down, or didn’t go down. 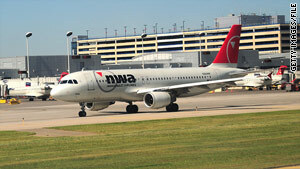 Having the public find out that their pilots are engaging in sexual exploits mid-flight would be a PR nightmare for NWA. The FAA uses the statement, “while you were on a frolic on your own,” in their explanation of their revocation. To me, there’s something interesting (and funny) about that phrasing. So, two 50 year old men lose their jobs for “frolicking” and the information that’s coming out seems a little vague. To me, it seems rather obvious what was going on. And, for those of you that have ever engaged in any kind of romantic affair while driving, then you know how easy it is to miss a turn. Not a big deal, really.